I first went to Snyder Middleswarth Natural Area about fifteen years ago. Massive, ancient hemlock trees rose over the forest with boughs of deep green in a valley carved by a stream, nestled deep in the mountains. The place was silent, other than the breeze and the tumbling creek. I looked up the mountain slopes to see the giants rising far above the other trees. It truly felt like a primeval place. I don’t know if I had ever seen such a beautiful hemlock forest. These giants were 150 feet tall and about 400 years old. Even then, I’m sure, change was underway. The wooly adelgid had reached the forest and over the years this tiny insect would kill hundred of the ancient hemlocks, and leave many others fighting for life. I recently returned, and the forest was not the same. Now, towering dead trunks dotted the forest and other hemlocks were barely alive. The forest floor become populated with saplings from the sun. Yet, the forest was still beautiful and will find a way to heal, generations from now. We hiked up the Swift Run Trail between large cut logs of fallen trees, as the creek gurgled below. The day was hot and humid, and a sultry breeze hinted at the possibility of thunderstorms. A few large pine trees offered a reminder of the scale of the ancient hemlocks. Moss draped the fallen trees as ferns carpeted the forest floor. We reached an intersection with the Tower Trail, but we continued straight on the Swift Run Trail into the adjacent Tall Timbers Natural Area. I highly recommend this trail. The trail wasn’t as brushy, and the forests were healthier, with several green hemlocks and large pine. Rhododendron bushes surrounded the trail and spread over the creek, which had small falls and pools. While the trees weren’t as tall as those at Snyder Middleswarth, the forest was more scenic. The Swift Run Trail ended at the Krebs Gap Trail and we turned left, and crossed the creek, where we took a break. Rumbling skies soon arrived with the rush of air. The rain soon came as we huddled under a tree, trying to stay dry from the downpour. It was futile. The storm soon passed and we climbed the ridge to the top, where we turned left onto the red Thick Mountain Trail. This level trail was a pleasure to hike through scenic forests of pine, laurel, hemlock, and oak. We reached the yellow Tower Trail at a four-way intersection near the site of the old fire tower, and a dry campsite. 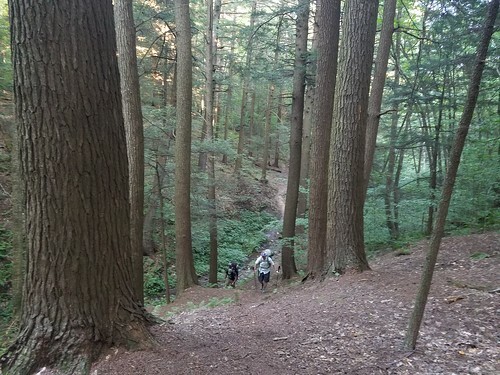 Here, the Thick Mountain Trail became yellow blazed (with some old blue blazes) and continued its level course on top of the ridge with more hemlocks. A rocky, twisting, and at times steep descent followed as we negotiated fallen trees. As we descended, the trail was steeper until we reached a small stream flowing underground, beneath moss covered rocks. We turned left onto Swift Run Road and returned to the parking area. 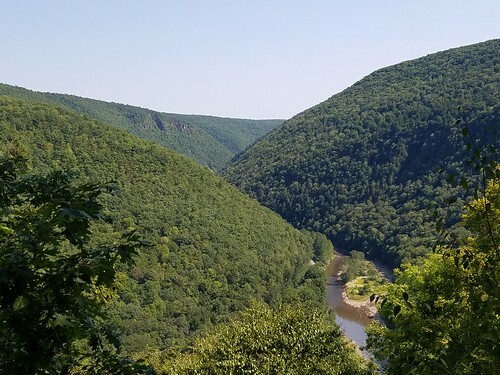 On both the ride in and out, we enjoyed the classic view of New Lancaster Valley, a sweeping, forested valley bordered by symmetrical mountain ridges. All trails are blazed yellow, except for a section of the Thick Mtn. Trail, which is red. There are also some older blue blazes. 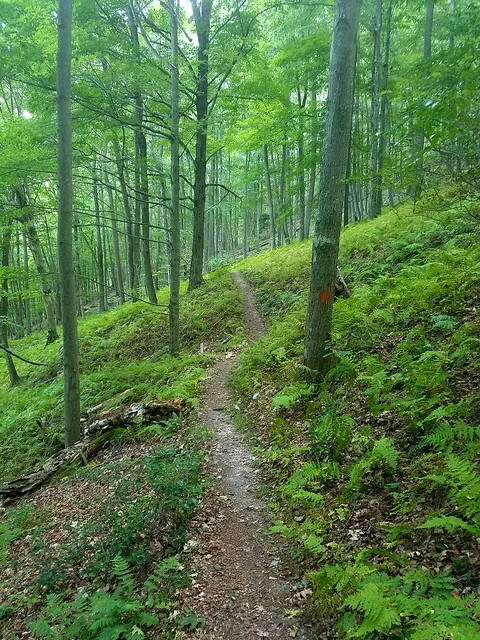 I highly recommend you expand the loop by following the Swift Run Trail past the Tower Trail into the Tall Timber Natural Area, turn left on the Krebs Gap Trail, climb to the top of the ridge and turn left onto the Thick Mtn. Trail, which returns to Swift Run Rd. This loop is about 6-7 miles in length. It is a beautiful, isolated woodland hike with small streams. Parking area is located at 40.809997, -77.283001. Nearby highlights are the New Lancaster Valley Vista, and Rock Springs Picnic Area, which has a small falls. Mike Servedio at the final, southern vista on the WRT. 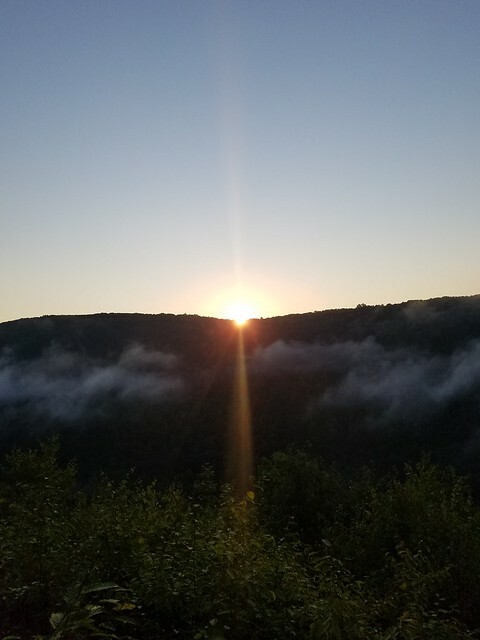 Over Labor Day weekend, I met up with two friends, both named Mike, to hike the West Rim Trail (WRT), Long Branch Trail, and finish on the Black Forest Trail. With perfect weather, I was looking to hike some miles and spend a couple nights in the woods. After shuttling cars between Slate Run and Ansonia, we began the hike. I was surprised to see so many cars at the trailhead. 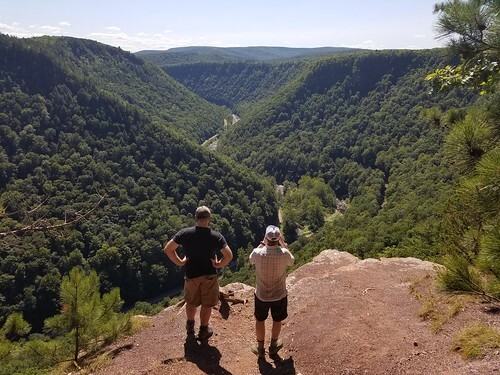 We made it to Barbour Rock in good time and enjoyed the splendid views of the canyon, known as the Grand Canyon of Pennsylvania or the Pine Creek Gorge. Carved by glacial meltwater, Pine Creek changed course from a northeasterly direction, to a southerly one through the mountains. It is one of the largest canyons in the east, measuring 50 miles long and 1,500 feet at its deepest point. The trail hugged the rim with more views. Pine Creek was very low; it has been a dry summer and we were a little concerned about water since most streams along the WRT are small. The trail went around Colton Point State Park and we passed two nice campsites along Bear Run, which was a muddy trickle. Several new, thick timbered foot bridges have been built along the trail- and one crossed Bear Run. We hiked through scenic woodlands with small streams and sunny meadows over hilly terrain. There were many people on the trail and we passed several groups camping. The WRT returned to the rim and we found a place to camp along Horse Run, also a trickle. There was a nice site above the trail under large, old growth hemlocks. It was a beautiful spot. I hiked out to a nearby vista where several more people were camping to enjoy watching the sunlight inch up the east side of the gorge as the sun set to the west. We hiked about 9 miles. That night I awoke to hear the eerie calls of coyotes echoing through the forest. They seemed both close and far away. I got up early and hiked out to the vista to see mist levitating in the gorge. I stayed until sunrise. We made our way along the rim with occasional views. The WRT turns away from the rim, in and out of stream drainages, at multiple places. The trail offers views down into these side gorges through the trees. We took a break at Little Slate Run, the largest side stream with large campsites. It had the most water of any stream we encountered. As we hiked back to the rim we looked deep into Little Slate Run’s steep gorge and heard a few waterfalls. We reached Bradley Wales picnic area where there were several superb views of the gorge in the bright sunshine. This day was a bit warmer than the previous. We took a break at the picnic area, which was filled with hikers and backpackers. Several mentioned hearing the coyotes from the prior night. A hand pump provided water. It was a great to relax in the grass. Leaving Bradley Wales, we briefly lost the trail, following the road instead. The trail crosses the road and enters the woods across from the restroom area. The trail was nice through the woods. Suddenly, we saw a bear get up, followed by a cub. The bear hurried down the trail as a second cub appeared from under a fallen tree and followed. I have never seen so many bears as I have this year. A guy running on the trail came along and told us that bear had been a common site and I half expected that it had been named. The hilly trail offered great woodland hiking under spruce and along a meadows. We made our way back to the rim. The southern half of the trail is different from the northern; there are much fewer vistas, but the trail also feels more isolated since traffic is often heard around Colton Point State Park. We enjoyed one vista looking down the gorge and soon entered the woods. 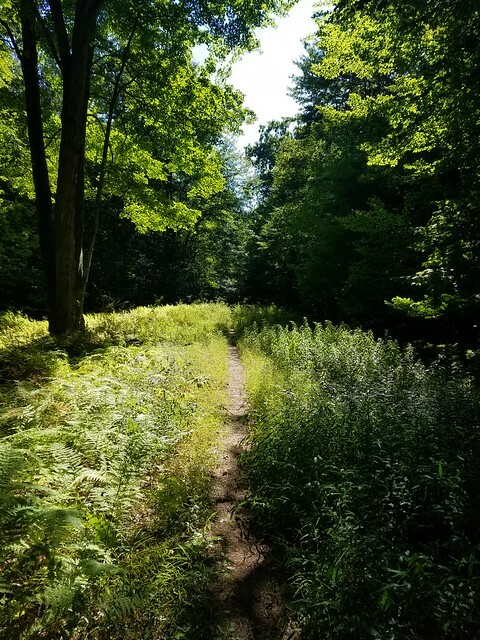 The trail was in good shape and offered more fine forest walking with small meadows, fern glades, pine, oak, and teaberry. I liked how the trail winds in and out of the side glens, following the edge of the plateau, enabling hikers to look down the steep slopes below the trail. Water was a concern due to the dry weather. Steel Hollow had a few small seep springs. Dillon Hollow had a small stream that was flowing, and a couple nice campsites. The terrain was rolling, if not hilly, but I found the hiking through the woodlands very enjoyable, even with fewer views of the gorge. 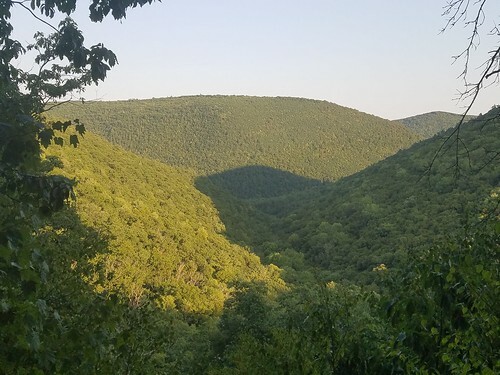 The trail followed the contour above Bohen Run across fern glades and one last view of the day, as the amber sunlight filled the gorge as the shadows cloaked the lower elevations. 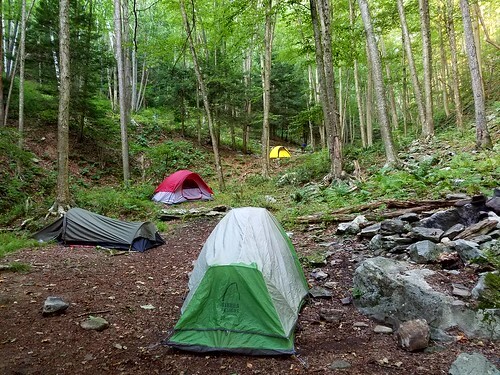 We reached Bohen Run, also reduced to a trickle, and set up our tents. A couple camped above us. Later, a father and two young kids walked along the trail looking for a place to camp, but they hiked further down the Bohen Trail. The weather was warmer than we were anticipating. To complete our route on the Long Branch and Black Forest Trails, we had about 15 more miles to go. Further, due to the dry weather, the waterfalls we hoped to see on the Long Branch Trail were likely reduced to trickles. 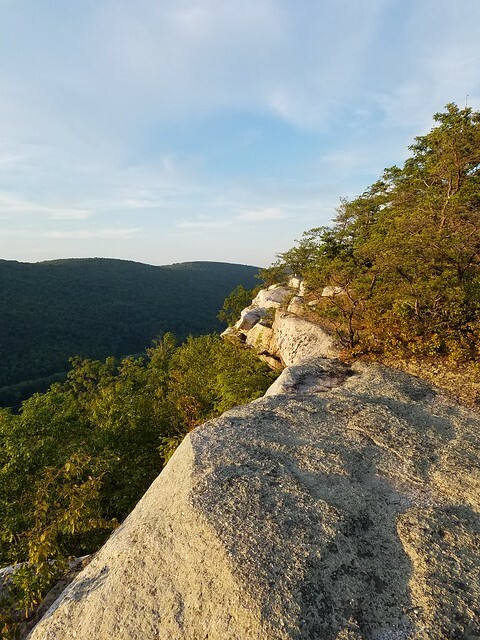 So we decided to hike the rest of the WRT and finish the trip at Rattlesnake Rocks, and hope to hitch a ride to Mike’s car which was still at Slate Run. We got a fire going and enjoyed the rest of the night. We got up to a beautiful morning as mist hung through the trees and splintered rays of sunlight. One side of the glen had hemlocks and birches, trees commonly found further north, while the other had oak and ash, more southerly trees. The diversity right at our campsite was unique. We returned to the trail and the gorgeous woodland hiking continued as the side of the gorge fell away through the trees. We reached a final, beautiful vista over Blackwell and Gillespie Point. The misty haze in the valleys below hinted at an even hotter day. The trail crossed over the plateau with more scenic forests of pine, hemlock, and laurel. I really enjoyed the walk. We crossed a dirt road and were treated to pine forests and glades of ferns, creating a wonderful aroma. Along the way we passed a dynamite shed that may be a century old, a remnant from the logging era. We passed the juncture to the Long Branch Trail, vowing to return and descended along Lloyd Run and its deep glen. There were hemlocks and small waterfalls below us. Again, a gorgeous hike. The trail reached the bottom in a pine forest and a great campsite. We crossed a field and finished the WRT. Across the road was the parking area. Now, we had to find a ride to Mike’s car at Slate Run. A group of backpackers from Pittsburgh were finishing at the same time, but were driving the opposite way. Mike went out the road and thumbed for a ride. The second car that passed pulled over and gave him a ride. The WRT is a great trail that I enjoyed very much. 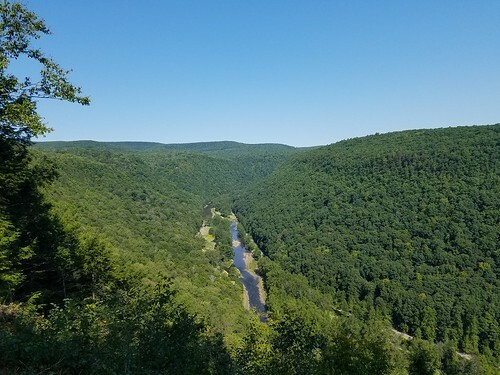 I love the entire Pine Creek Gorge region. Over the last few years, there have been a profusion of new trails, making the gorge a true hiking and backpacking destination. The WRT is a 30 mile long linear trail, blazed orange. The easier route is to head south. To save the best vistas for last, hike north. Most vistas are at the northern half of the trail (north of Bradley Wales). We saw three vistas south of Bradley Wales. The northern half is closer to roads around Colton Point State Park, so you can hear occasional traffic. The southern half is more isolated. We hiked in dry conditions. We saw trickling water at: Bear Run, Horse Run, Steel Hollow, and Bohen Run. Dillon Hollow, Lloyd Run, and the left branch of Fourmile Run had low, flowing water. Little Slate Run had the most flowing water. Hand pump well available at Bradley Wales in season. There is also a spring near Fahnestock Run and West Rim Road. Campsites on the WRT can be small in size. 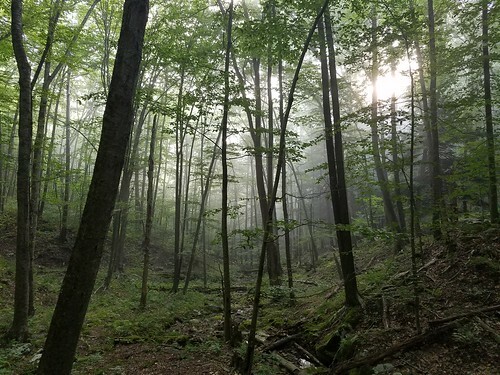 We saw campsites at: Bear Run (2), left branch of Fourmile Run (near dirt roads, 3-4 sites, spread out), Burdic Run, Horse Run (on bank above the trail), Little Slate Run (2 large sites), Dillon Hollow (2 sites), Bohen Run (two smaller sites), bottom of Lloyd Run near the southern terminus (one large site). Dry sites also available at many vistas, which seemed to be the preferred camping option that we saw on our trip. Want a challenging, and extremely scenic, hiking option? Hike south through Colton Point State Park and enjoy the numerous vistas. Take the Turkey Path down to Fourmile Run. Bushwhack up Fourmile Run (may be a faint trail) to see a stunning gorge and three superb waterfalls. 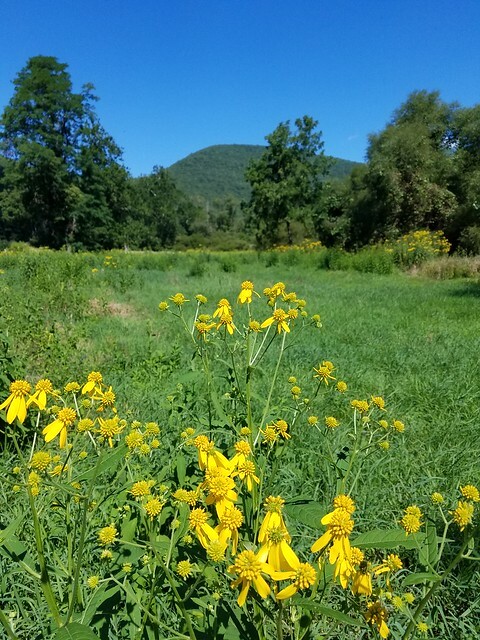 Connect with Leetonia Road, and hike back to the WRT. 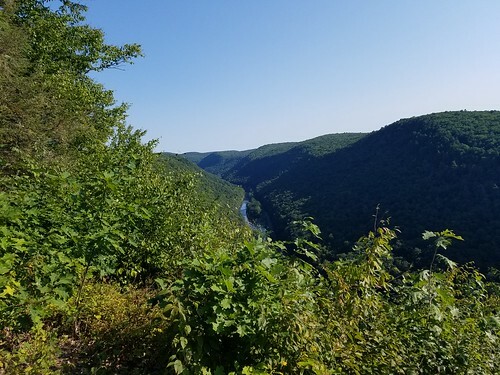 At the vistas north of Bradley Wales, make sure you hike down the dead end dirt road (if hiking south, the WRT follows the road to the right, go left) to see the best vista of all those near the picnic area. Nettles can be a problem from Good Spring Hollow to Gundigut Hollow. Mountain laurel abounds along the trail, making it ideal in June when it blooms. 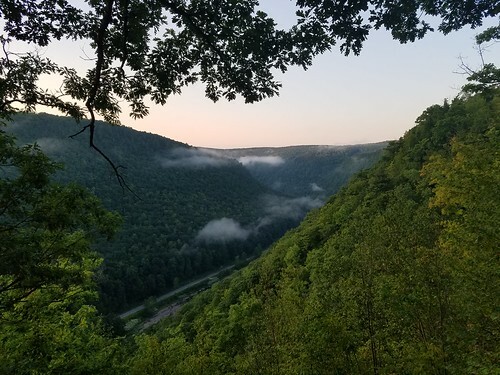 The WRT offers many fine vistas, several off trail waterfalls, beautiful woodlands, scenic streams, and since it follows the rim of the gorge and side glens, steep terrain falls away from the trail, enabling you to look down the steep forested slopes. Want more? Side trails connect the WRT to the Black Forest and Mid State Trails. This is a hiking paradise. 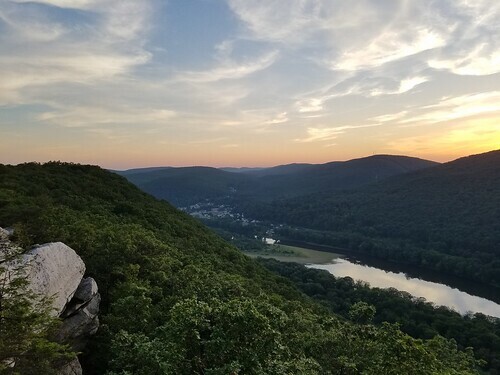 Sunset from a vista off of the Mocanaqua Loop Trail. 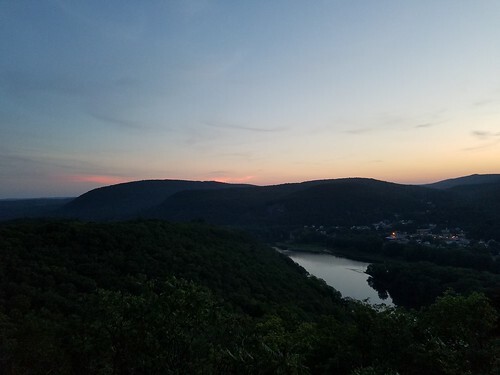 I returned to the Mocanaqua Loop Trail for an evening hike to see the sunset from a view above the Susquehanna River. 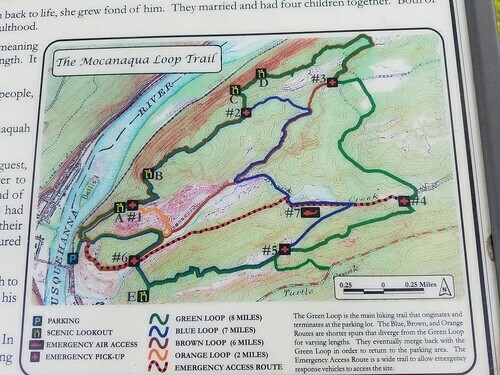 The trail system has about 17 miles of interconnecting loops, with the green trail being the perimeter loop, and longest. This is a unique trail system. Blazes consist of colored dashes on a white background painted on trees; trails can have multiple colored blazes. There are a few signposts at trail intersections. This is also an area that has been mined, and the result of that is obvious with massive culm piles and deep trenches, pits, and chasms in the ground. But don’t be completely dissuaded from hiking here- on some trails the forests have healed and these mining relics actually are fascinating, creating an odd topography. This is a rock lover’s paradise, with ledges, cliffs, and big rocks everywhere. Mocanaqua is well-known to climbers. There are several nice vistas. Much of this is now part of the Pinchot State Forest, and is known as the Mocanaqua Tract. I followed the green loop clockwise from the parking area, to the ridgeline above the river. This was an out and back hike. 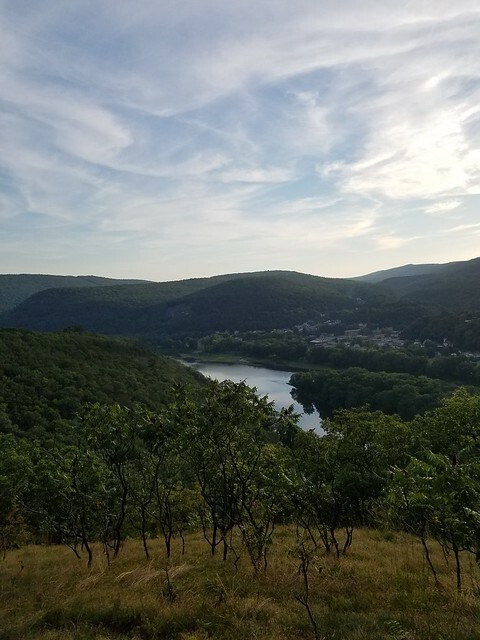 The trail meandered up and around ledges offering views through the trees of Shickshinny. The trail followed an old grade, passing pits and chasms in the ground as ledges rose overhead. The forests were scenic and the trail was a nice walk. I passed more open views from a meadow with a great view of the surrounding mountains and ridges as the river flowed far below. I climbed up the ridge and left the trail to the vista I was looking for, which was less than a hundred yards from the trail. The vista was from a huge, sloping ledge of white conglomerate with superb views up and down the river. Pitch pine grew from the crevices. I sat and watched the sunset as the valleys fell into twilight. Sloping rays of light were the boundary between the sunlight and twilight. Orange and red spread across the horizon. I loved the views to the southwest with tiers of ridges that stretched deep into the horizon. I retraced my steps and hiked out in the dark. How do you get to this off-trail vista? From the sewer plant, walk the gravel road for about 500 feet and turn left onto a narrower trail, blazed green. This turn is easy to miss. Hike this trail up the ridge, stay on the green trail and pass two vistas.